x2 back panels 18" x 14"
1. 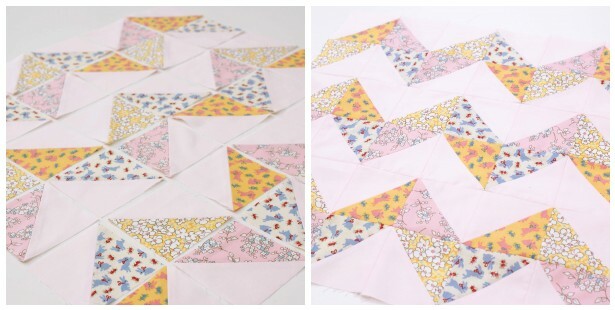 Cut your squares for the pillow top; 18 in printed fabric and 18 in solid colour. Separate into piles. 2. Now we are going to make our half-squares triangles. Firstly, lay a printed fabric, and solid fabric right-sides together. Line up your ruler and mark a light pencil line through the diagonal. Now sew a 1/4" seam allowance from both sides of the diagonal line, I recommend using a 1/4" sewing foot for true accuracy. 3. 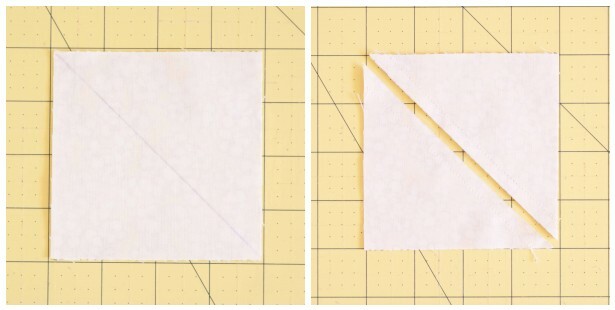 Cut your square in half to create two half square triangles! 4. 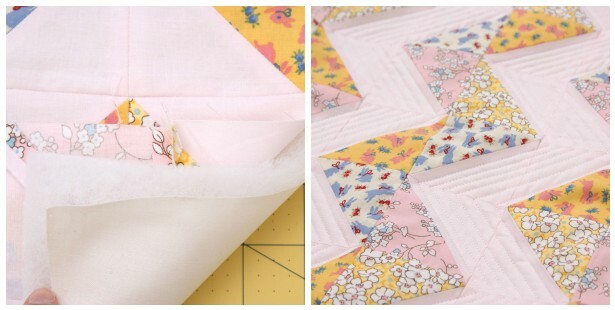 Press your seams open to allow the blocks to lay flat. Trim your HST's if necessary using a rotary cutter to measure 3 1/2" and place into piles for easy choosing. 5. Lay your design out following a simple zig-zag chevron pattern. I avoided having different printed fabrics next to each other, but you can change it up how you wish! 6. 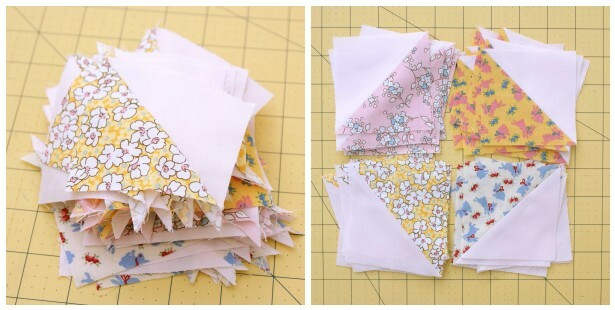 Once you have decided on your layout you can start sewing it together. 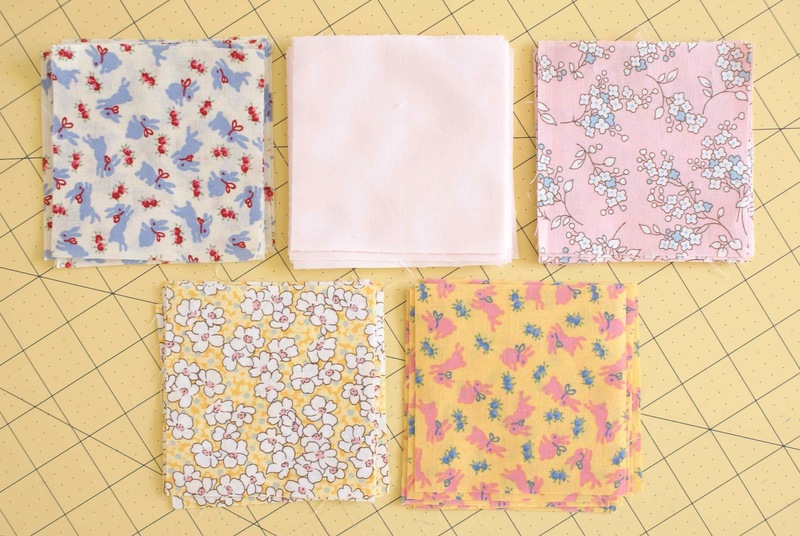 Begin by sewing it row by row, once these are done you can sew them together to create your pillow top. 7. If you wish to quilt your pillow, simply lay your muslin or scrap-backing fabric (remember you don't see this part) with your wadding and pillow top together in a sandwich as shown. I should advise you to baste, but I didn't bother with this! eek, I'm bad! So I just used my curved quilting pins to hold in place. 8. I used a straight line quilting effect for this, which I think looks really effective, but you can quilt however you'd like! 9. Trim the excess wadding and backing fabric to square up your pillow top. 10. To make the envelope back, fold over the edges of the two back panels by 2" and sew. With right sides together place your backing panels on top of the pillow top, pin in place and sew 1/4" from edge. If you need more help with this part, I have a simple envelope closure pillow tutorial for you to follow in closer detail. I hope you enjoy your new pillows! if you have any questions, please ask away :) and if you haven't already, don't forget to enter my fabric giveaway in celebration for the launch of my new shop! 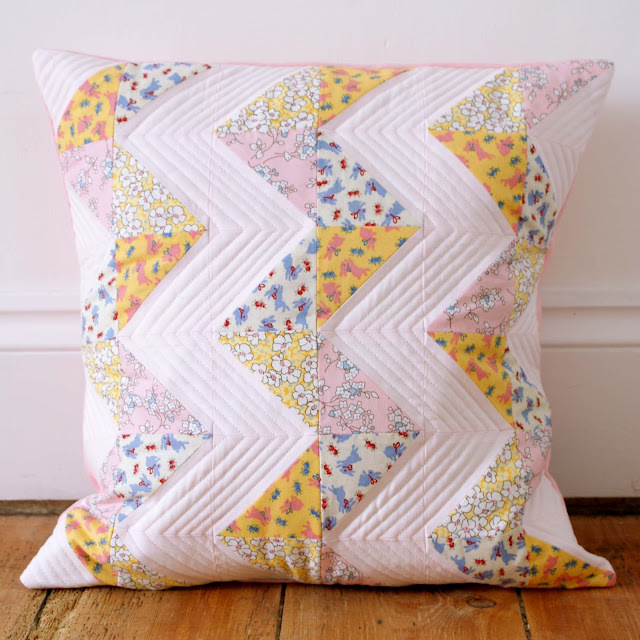 Oh this pillow is so lovely...reminds me of popcorn and marshmallows! (Is that weird??) Anyway its an absolute beauty! WOW! This is beautiful... I might have to try this in a mini quilt aswell as a cushion. It's such a pretty pattern! Thank you for the fab tutorial. I made one today, using solid colors. Thank you so much for sharing this tutorial - it was easy to follow! Beautiful pillows patchwork !!! Love the fabric combination!!! This pillow is absolutely adorable and amazing. I really like this pillow design, quality and specially patch work. Also colour combination is too good. I just made this pillow and am so pleased with it! Thanks so much for the tutorials--it was my first pillow and I used your envelope closure tutorial as well; so simple! I've never done any patchwork before either and this came together so easily. Definitely keeping an eye on your blog for future projects!